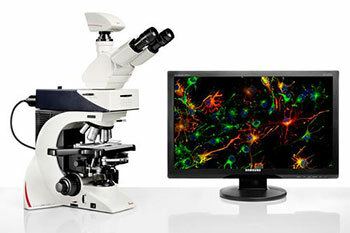 Both the Leica DM2500 & DM2500 LED microscopes are great tools for demanding tasks in life science routine and research applications. With their powerful transmitted light illumination, high-quality optical performance, and state-of-the-art accessories, the Leica DM2500 and DM2500 LED are especially well-suited for challenging life science research tasks that require differential interference contrast or high-performance fluorescence. The difference between the two microscopes is their illumination: The Leica DM2500 LED is equipped with LED illumination for transmitted light, whereas the Leica DM2500 works with halogen. Both types of illumination render a realistic impression of the colors of the sample, so that users in clinical applications, such as the frequently used HE specimen staining, are able to assess the colors of their samples accurately. Designed with application-oriented modularity, the Leica DM2500 & DM2500 LED can be configured to fit a wide variety of applications and accommodate the diverse physical requirements of individual users. The microscopes are certified for in-vitro-diagnostics (IVD).